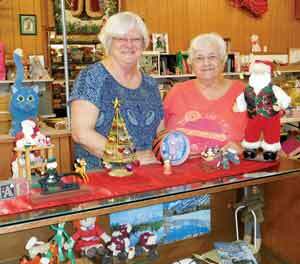 The Marine Toys for Tots program might get more national recognition, but on the local level, the Christmas Toy Shop deserves credit for making a powerful difference for families in need. 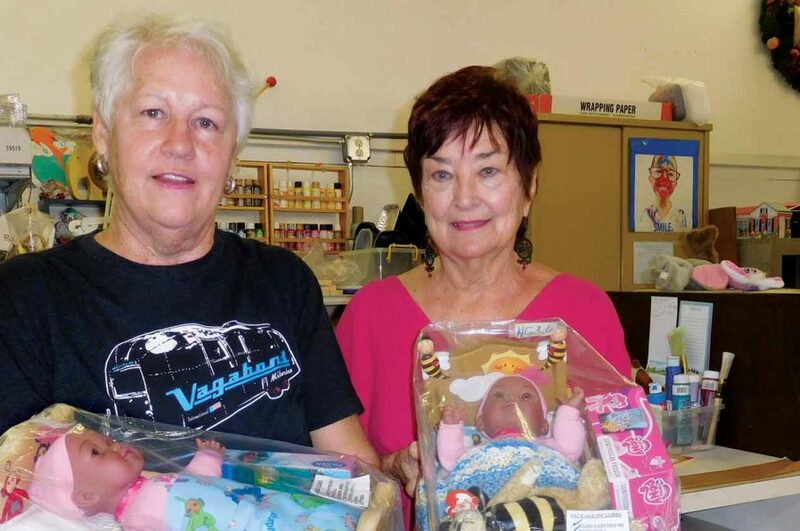 “We’ve had young adults stop by and say their mother got toys at the Christmas Toy Shop, and now they’d like to come back and volunteer with us,” says Sharon Jackson, a former president of the nonprofit charitable organization. 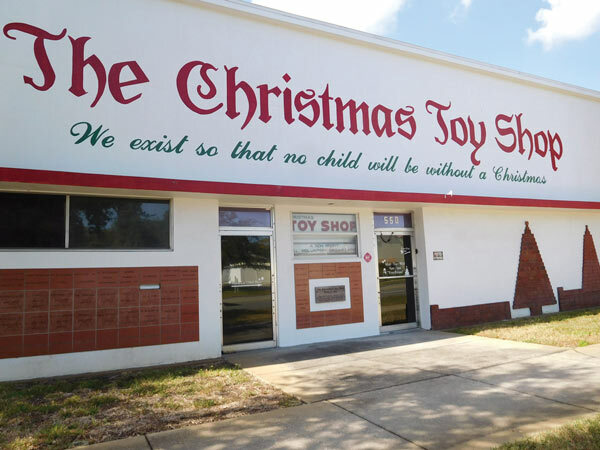 The Christmas Toy Shop has been serving needy families in Pinellas County since 1921, making sure that thousands and thousands of children have awakened on Christmas morning to presents from Santa. Families are referred by Pinellas County social service agencies and have to prove need. According to Sharon, last year alone they served 816 families – a total of 1,914 children ages infant through age 12. Every child gets a wrapped Christmas package that includes a selection of gifts – both new toys and gently used items which have been refurbished by the Christmas Toy Shop volunteers. A book is always included in the package, along with stocking stuffers, says Sharon. Each family also gets a bike. 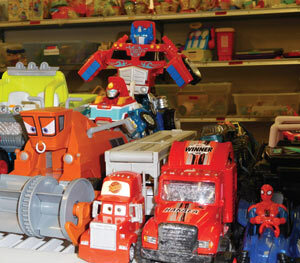 The toys arrive at the Christmas Toy Shop year-round and in a variety of ways. New toys are typically donated during the holidays by a long list of groups including service organizations, churches, businesses, scout troops, and schools. Many restaurants, clubs, and lounges place a Toy Shop barrel in the lobby to collect toys from customers. In addition, the Christmas Toy Shop also has a small budget and can purchase bikes direct from several wholesalers. But many of the toys are donated gently used. Then, like the children’s story in the Velveteen Rabbit, they’re fixed up and made new, ready to be loved once again. In November when I visited, the volunteers were spread out throughout the building doing what Santa’s elves are expected to do: sorting, cleaning, sewing, painting, assembling, and packaging toys. There were aisles and aisles of Barbie dolls and baby dolls, stuffed animals, puzzles, board games, action figures, PlayStations, soccer balls, and dozens of other assorted toys of all shapes and sizes. 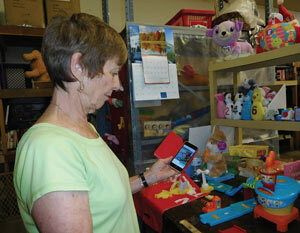 Over in the infant and toddler toy section, Ann Ruppert was using her cell phone to research a model toy airport so she could use it as a guide to help her correctly assemble the many parts in front of her on the work table. “We don’t give anything out until we have all the parts; we want the toy to be complete,” says Ann. Toys missing a piece are set aside. Sometimes the manufacturer can send a spare part. But often, the same type of toy may be donated at a later date. Then the parts can be mixed and matched. In the bike repair shop, workers are tightening screws, fixing tires and handlebars, and making sure everything runs smoothly. Last year, nearly 600 bikes were donated, everything from tricycles for toddlers to 26-inch bikes for pre-teens. About half are new and come in a big box ready to be assembled. That’s what the bike repair guys were doing the day I visited. The bikes that are donated usually require a little TLC to look bright and shiny once again. The bike repair elves do that, too. 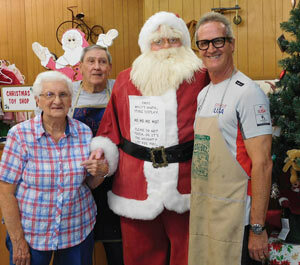 Ted Lee is 82 and has volunteered at the Christmas Toy Shop about five years. “I always liked fooling around with bikes and everyone kept telling me that the Christmas Toy Shop could use me. So I decided to volunteer. 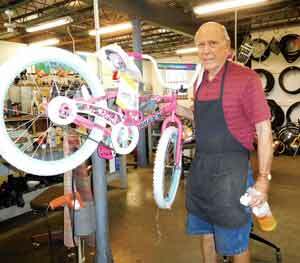 It gives a sense of fulfillment to turn an old bike into something new for the kids. And it sure beats sitting home doing nothing,” jokes Ted. 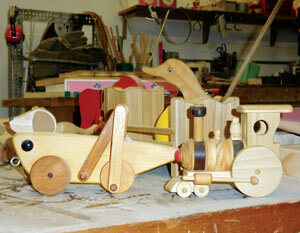 Bonnie Otis, a retired art teacher who lives in the Old Northeast, and Jane Cook, add the artistic touch to toys. During my visit they were painting cool multi-colored fish on wooden puzzles. The puzzles would then be paired with similar toys, perhaps a Beanie Baby fish and a children’s storybook about fish. The two also have the fun task of painting decorative designs on adorable doll beds crafted by Klaus Ocher, the Christmas Toy Shop’s expert woodcraftsman. Klaus has his own small woodworking shop at the back of the building with all the tools he needs to make the doll beds and old-fashioned pull toys. Once the doll beds are crafted and painted, the next stop is the Christmas Toy Shop’s sewing department, where the ladies make matching pillows and blankets, as well as handcrafted dolls and doll dresses. The finished package is over-the-top adorable, a present any little girl would be thrilled to receive. The hundreds of electronic toys that are donated are inspected by Art Surplus, who does whatever repairs are needed and makes sure the batteries are working. He also adds an extra battery just in case. ”We don’t want any child to have a toy on Christmas morning that doesn’t work because it’s missing a battery,” says Sharon. What a wonderful blessing you all are there at the toy shop…my friend from Miami Ann is there with you and i know she loves working with toys and all. She helped me with a manger scene here in Miami ask her about how we tried to carve out the Holy family one very hot July day…she is a jewel and now you have her and also my very dear friend Raye who used to do several things for me and my family from taking spots out to repairing other stuff and also feeding my son when he and his friend would come to her dock with their little boat…we are still great friends from afar….Momma Raye wishing you a Fabulous ? ?birthday this year….will see you in a couple of weeks…do you need more toys for this year i can bring some from Miami first of Dec. Blessing to you all….Santa’s angels…wish l still lived there to help…you are in my prayers!! !